With the small wooden crate still almost full of vitelotte potatoes in the kitchen, I have no choice but to keep on cooking potatoes until I exhaust every single tuber. Maybe at the end of this week, I will be so fed up of these potatoes that my violet potato phase will be history. 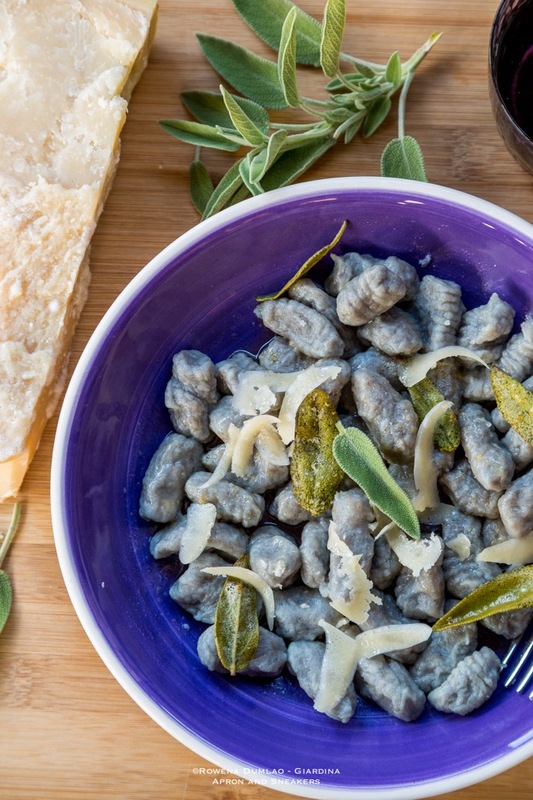 The vitelotte potatoes are perfect for making gnocchi, according to the producer. No one knows the potatoes better than they do, so I'm not arguing with that. Let me tell you though, I am not really a gnocchi-eater. I still remember the first time I tried it in a restaurant in Genova, Italy. I ordered gnocchi ai quattro formaggi (gnocchi with 4 cheeses). My eyes almost popped out from the creaminess of the pasta. Don't get me wrong, the dish was good. It's just that four kinds of cheeses mixed with cream on top of the potato gnocchi overwhelmed all my senses. I still don't understand why I ordered it in the first place. It should be the gorgonzola that got me. That was the beginning and the end of my gnocchi experience. I do try it once in a while with an ample serving fit for an ant and only when it's topped with tomato sauce or maybe butter & sage at times. So when I was making the gnocchi, my husband gave me a long, baffled look. "Why are you making this pasta when you barely eat it?" He didn't need to remind me. I was wondering about it myself. What are these potatoes for if I don't make any gnocchi? Do I sense hesitance here? He is the only one who eats them at home, unless you count my ant-sized serving. 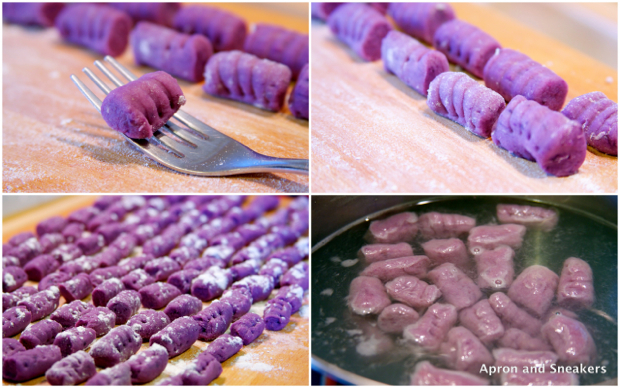 Gnocchi anyone? It was my first time to make this pasta from scratch. When I finished the kneading, cutting & shaping the pasta, oh, and taking pictures too, I stepped back and looked at the pasta lined up like soldiers on the pasta board. Look at that, all made by my own hands. I have to admit, I was pretty proud of my handy work. I happen to own a pasta maker that still remains untouched after about a decade because I don't understand why I have to labor in the kitchen to make the pasta myself when I can just zip to the shop to buy them done already, fresh or dry. 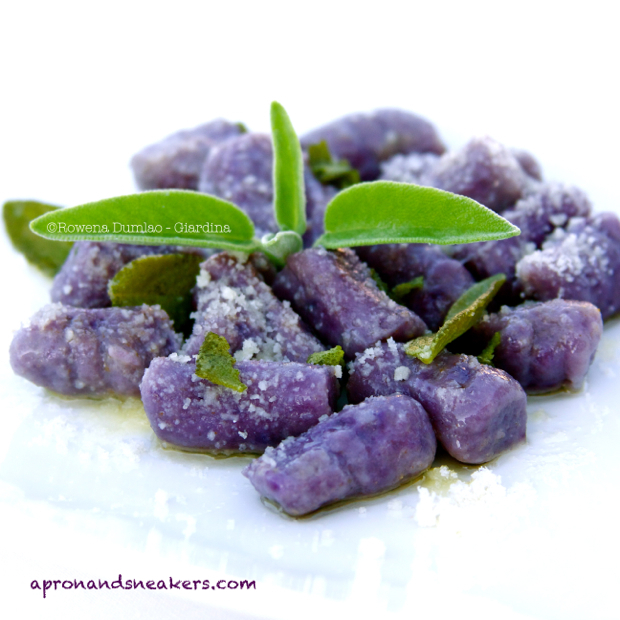 Maybe there is a spark of hope of reconsideration after these gnocchi. I did two kinds of sauce for the gnocchi. One red and the other, the simple and classic butter & sage. I ate both servings. I ate everything in my plate and even got seconds. As I finished the last forkful, I wondered how I could have eaten so much. The pasta was not so heavy unlike the usual ones. I am thinking, it's the kind of potato that I used. There's a certain delicacy it gave to the pasta. The producer had a point. These vitelotte potatoes are really good for making gnocchi. Boil the potatoes in salted water. When they are cooked, peel off the skin. Mash the potatoes using a potato ricer or if you don't have one, use a masher. Make them fall straight on a pasta board sprinkled with flour. Add the flour & egg. Mix with your hands. 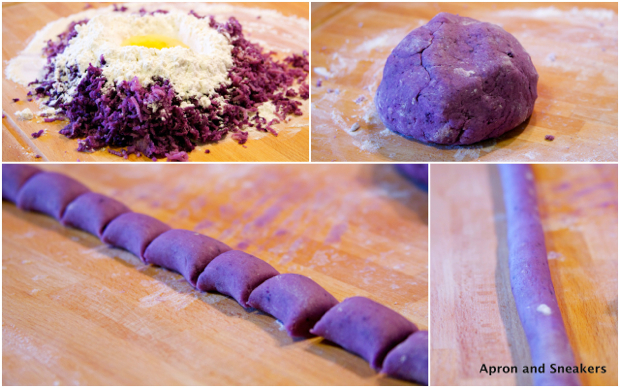 Knead until you have a compact pasta dough. You can add more flour (gradually) if the dough is too sticky and soft. Take a little piece from the dough and roll to make a long cylindrical shape. Slice 1-inch pieces with a knife. Let each piece slide on a gnocchi board or fork starting from the top. Put them on a plate or the same pasta board sprinkled with flour and sprinkle flour on top again. Boil some water. When it boils, add some salt. Drop the gnocchi. Cook them until they float about 3 minutes. Take them away from the water with a slotted spoon. the transfer to individual pasta bowls. Meantime, on low heat in a saucepan, melt the butter. Add the sage leaves then cook for about 3 minutes. 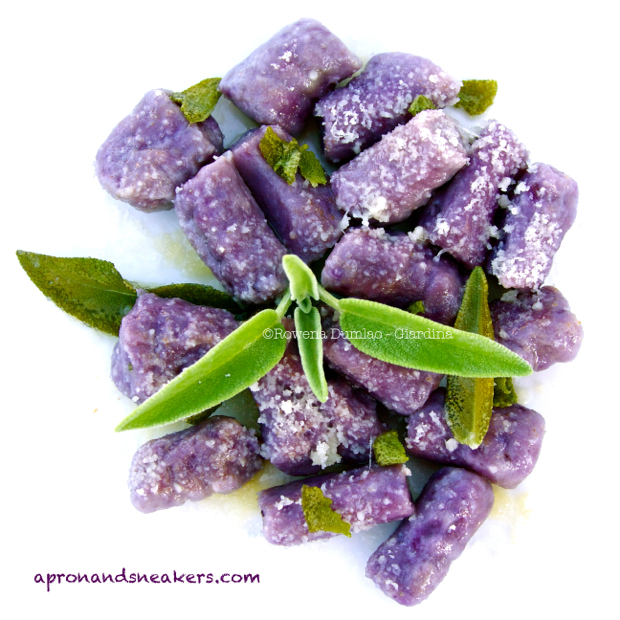 Pour the browned buter with sage on the gnocchi then sprinkle with the Parmigiano Reggiano. Serve hot.